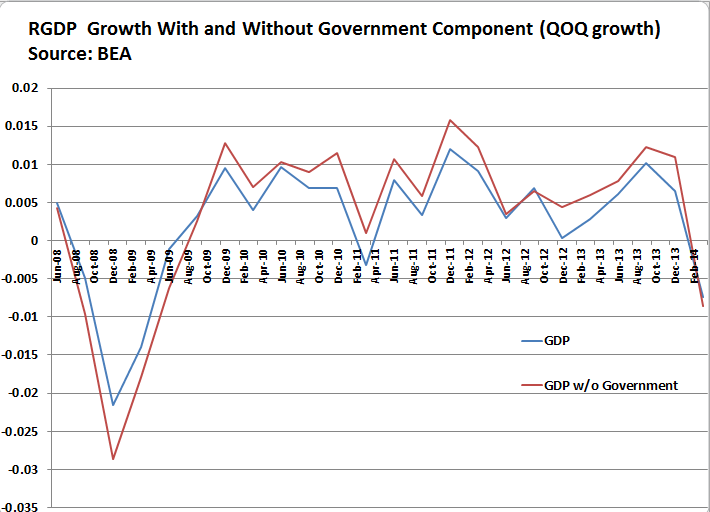 What if we measured economic growth without the government component of GDP? And so I did and the results on the face of it are "good." You'll note that ever since recovering from the depths of The Great Recession, GDP without government (ie - the private sector) has been outpacing the component of growth coming from the public sector. This is good in the sense that the private sector is growing faster than the parasite that lives off of it. Theoretically, if this kept up, government would shrink relative to the rest of the economy, even to the point it would consume less than 1% GDP. The government component of GDP does NOT include income transfers which account for the majority of the budget at both the state and national levels. If GDP does NOT consider income transfers, how do you make an "economic argument" to incorporate income transfers into the calculation of GDP, primarily that they should be SUBTRACTED from GDP to measure the true economic production of a nation? Specifically, just because a bunch of old fogey Keynesian economists said GDP should not subtract income transfers, what is the argument and rationalization that we should? I know the answer, but I'd be curious to see if you do. GDP was designed by the government and for the government and we're used to using it because we have data for it. The problem with the economy is that as soon as we're above subsistence level the political factor prevails and whoever panders to it will win regardless of the effects. In the total order of things economists are just third fiddle in a really big orchestra. the president would want a way of measuring the economy that did indicate its total capacity to produce but did not show additional government expenditure on armaments as reducing the nation’s output. I'm not sure I understand the question, but it sounds like Keynesians attempting some circular logic. If I understand what you mean by income transfers, then it sounds to me like Keynesians are attempting to demonstrate greater GDP by simply incorporating their own deficit spending into the calculation of growth. However, simply transferring wealth is not growth as nothing is produced in the transfer. GDP is supposed to be a loose measurement of the year-on-year or quarter-on-quarter value-added to the economy. That becomes impossible to actually calculate when valued in a moving-value currency, and leaves the calculations ripe for inaccuracy if you're simply going to count transfers of (ever more) worthless fiat as "production" of "value". I didn't use Google to try to understand your terms, did I get it right? You don't count income transfers because you're calculating production by adding all the money spent on stuff, and income transfers aren't used to buy stuff, unless the transferee then buys something, in which case it would show up in C. For the victims of the income transfer who are not buying stuff because their money was taken, they are making C less than it would have been without the transfer. Subtract collected tax, and deliberately created inflationary debt spending ( inflation is a double subtraction, it damages existing money, AND it competes with existing money for real goods ). This spending is all "broken windows" ALL OF IT. Add back basic infrastructure maintenance that is less than "stimulus". Even in a free market, ya gotta pay for roads. All of that government spending, either paid for, or floated with counterfeiting, is economic damage. There is where the Austrians are right in saying that government spending should count against GDP. I here this idiocy on the Nightly Business Report and CNBC and such how important government spending is to the economy. If that is true, then I guess we have a Soviet economy without the food and other shortages? I get tired of hearing "The Multiplyer Effect! The Multiplier Effect." Then Speaker Pelosi kept/keeps talking about the wonderful miracle hidden in transfer payments. But what is the Multiplyer Effect had a coefficient less than one? And what is the multiplyer of private investment compared to the effect of a transfer payment? The simplest answer is that the basic equation is fundamentally wrong. A simple sign change, resisted by anyone who still thinks Keynesism works.